This past Wednesday I rode up from Rollinsville, CO to Rollins Pass and the Continental Divide. This is the former path of the Denver, Northwest and Pacific Railroad. It was used by trains to get over the Continental Divide before the Moffat Tunnel opened in 1928. This road is also called the Moffat Road. David Moffat was an American financier and industrialist, and one of Denver’s most affluent citizens. He was big into railroad development and envisioned a tunnel through the divide, but started with putting a line on “the old Ute Trail” over the divide until he could line up financing. Building the tunnel was much more expensive than anticipated, and it wasn’t completed till 1927, 16 years after Moffat died penniless. Building the Denver, Northwestern and Pacific Railway and tunnel had cost him his entire fortune. A short distance from the trail is the tunnel which is still in active use by Union Pacific. When the snow is flying, the Winter Park Express will take people from Denver’s Union Station through the tunnel to Winter Park. It was a long ride, roughly 50 miles out and back, but on a gentle 3% grade the whole way. The fall color along the way is quite spectacular. As you climb you come upon Yankee Doodle Lake nestled in a hairpin turn of the line. At the lake there is what appears to be a cave. It is actually an attempt by the old railway company to drill a tunnel to reduce operational costs. It was abandoned because of high cost. As you get above tree line you will see the Needle’s Eye Tunnel in the distance and another lake, Jenny Lake, down below. The tunnel itself is closed because of falling rock. At this point, you can climb a trail above the tunnel. Once you get up there, you’ll find what appear to be stone foundations. These are blinds created by early Native Americans over 3000 years ago for game drives. Bighorn sheep and elk were driven toward these blinds where natives were waiting. There are more than 96 of these drives in this area. The rails were removed in the 1930s, but there are trestles still in place along the route. They are in pretty good shape for being out in the high mountain elements for 100 years. On the way back from the top of the pass I rode over them (with some shrinkage!) and they were fine. See the video below for that. Once you get to the top you intersect with the Continental Divide Trail. And then it’s a fun 20 miles down all the way back to the car. 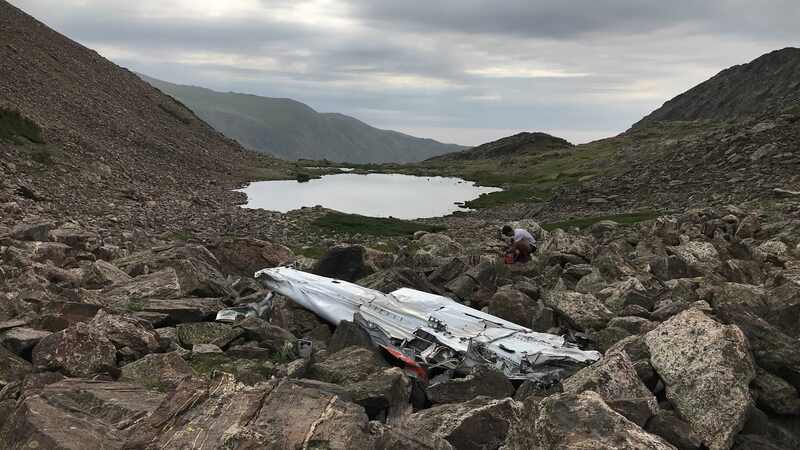 A few days ago I was looking at trails from the 4th of July trail head in the Indian Peaks Wilderness near Eldora, Colorado and came upon a blog post about a plane that went down in the area many years ago. From what I saw in my mapping app there is a road, but then you need to bushwhack your way for a few miles. My son and a few friends joined me this morning for the trek. We got up early and were hiking by 7am under cloudy skies. As we proceeded along the road we quickly came to private property signs. We turned back and got onto the Arapaho Pass Trail. At about 2 miles we hit an old mining camp with an abandoned house in the forest. At that point we starting the bushwhacking, but we stuck pretty close to a stream that flowed from the lake by the wreck, and that worked well. After a short stint of climbing directly up hill in the forest, we came upon a marshy mesa. We jumped from grass clump to grass clump to avoid swampy feet. We then began another climb up scree and boulder fields and had to choose our foot placement carefully. But the views were stunning. Then we had a few snow fields to cross. Finally we got to the lake. Right about this time it started to rain. With some sadness I thought about the poor guy who lost his life up here. A bit more about him. Michael Henry “Myke” Baar was a 29 year old flight instructor and United Airlines first officer. 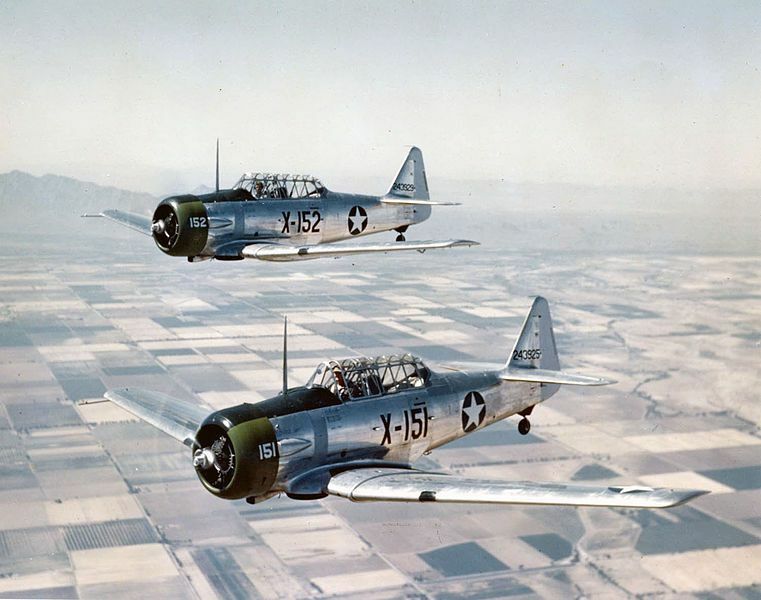 He had 4200 hours of flying experience, and 99 hours flying time in the North American T-6 Texan, a single engine training aircraft used during WWII and beyond. According to his widow, Myke “always used this route to cross the mountains, which he referred to as Jones Pass, because he could usually slip right over in any kind of weather.” On December 14, 1971 he was once again flying from Denver to see his family in Steamboat Springs, but downdrafts (per the NTSB report) contributed to his plane not being able to get over the continental divide. We continued along the south edge of the lake up the hill, as I had read the wreckage was above the lake. We spread out and my friend Segundo found it first. We then started our return before the afternoon storms would hit. After a bit of hiking we found another section of the plane, and speculate someone dragged it but gave up and dropped it. It was a solemn day. Last year when my son Kyle and I did the Colorado Trail, we had to route around Segment 7 because of wildfire. So I decided to ride it with my friend John Bissert, from Copper to Breckenridge. It’s a technically challenging trail for a bike, with lots of “hike-a-bike” sections particularly near the summit. We started on the Copper side as I figured most CT hikers will be on the other side heading west, and we’ll cross at the summit. That would give us a relatively free descent, and that proved right. Just shy of the summit we heard a booming sound in the distance. We then saw six slurry jets headed west to drop flame retardant on the massive fires near Durango. It was cool to see them fly in the valley, lower than us. On the Breckenridge side we ran into a CTF Trail Crew working on improving the trail, led by Brent Adams and Anne Englert. Kyle and I will join a 7 day crew in mid-July and it was cool to meet some of the folks we’d be working with. Today I geared up to ride Centennial Cone between Golden, CO and Idaho Springs, CO in Clear Creek Canyon. I started out on Mayhem Gulch. However, when I got to the top of Mayhem Gulch I found that the loop was closed. There are wildlife habitat restrictions until June 15.
no ride for you, 15 days! No worries, I got to ride Mayhem Gulch for my first time, and what a fun ride it is! The trail is a perfect 8% grade which makes it easy to climb, and just enough decline to get a fast descent on. I look forward to coming out later in the year and ride the whole Centennial Cone loop. 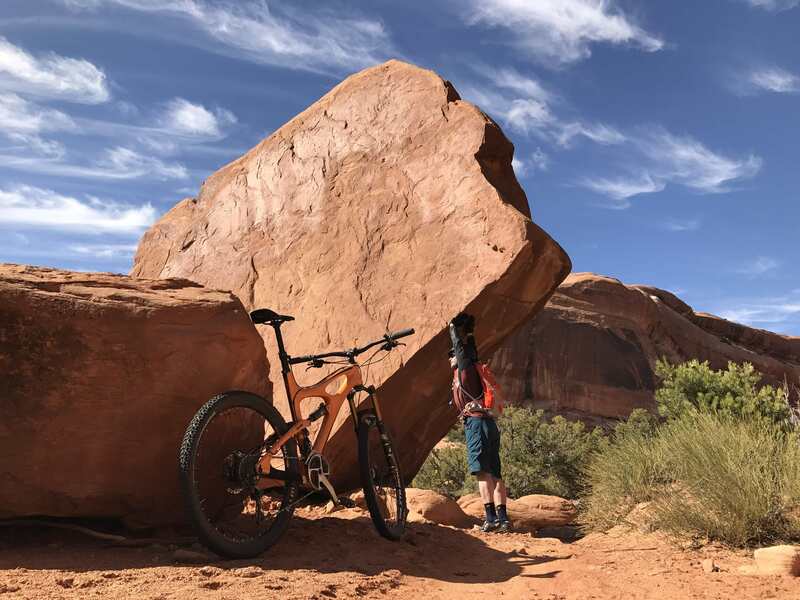 Poison Spider is an old trail in Moab, and strictly a “meh” ride for mountain bikers. It gets only 2.5 stars at MTB Project, and I can see why. Pros are great views and a fun technical section called “The Waterfall.” But cons include long sand traps and tons of ATVs. Next time I do this it’ll be on an ATV. I was psyched when my old friend John Bissert texted me over the weekend. “Let’s ride and catch up,” he said. John and I have been friends for 15+ years, and met when our girls (the two Taylors) were in girl scouts together. We became fast friends, mountain biking and road riding whenever we could. As our respective careers grew, we got busy with travel and family, and lost touch with each other. John was curious about the Colorado Trail bikepack epic that my son Kyle and I did last year, and reached out. We settled on Heil Valley Ranch on a beautiful 70 degree spring day. John was always wicked fast and strong on the uphill, and he still is. The pecking order was re-established with me in the back. But this time I had a good reason – to follow cam our descent down this great Boulder trail. Now that it’s starting to warm up, I headed back out to Fruita to take advantage of the sun. One of my favorites is Mack Ridge. You can ride the trail as part of a loop, or as an out-and-back. I combined it with a fun new trail called Hawkeye which I’ll save for another post. 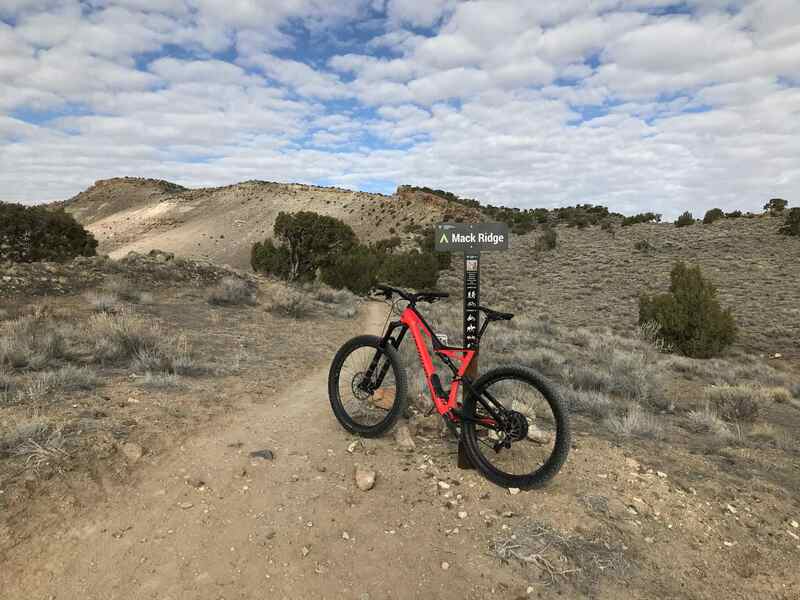 The ride starts with a long climb that isn’t too difficult, although you’ll pass through some gnarly rock fields that will probably have you off the bike. There’s also one hike-a-bike technical section that is a bit of a challenge to get through. Once you get to the top, you can take in stunning views of the Colorado River down below. Then the fun begins as you ride the ridge along the river with some exposure. Once I moved away from the edge I turned around to descend, and bomb down through the rock fields back to the start. Back in October I went out to Grand Junction for a few days to ride the Lunch Loops. It was my first attempt at riding here, and I started with Gunny Loop. Such a great ride! But a difficult one – I endo’ed twice and got both on the highlight vid below. One of my favorite rides in Moab is the Navajo Rocks Chaco Loop, which is an easy ride through and next to really scenic rock formations. The total ride is about 18 miles, so it’s pretty much a full day. I always thought the direction to ride was counter-clockwise. But after my third run last week, I thought this would be really fun clockwise. Sure enough, when I looked at the ride on MTB Project today, the recommend direction is clockwise. I can’t wait to go back in 2018 and ride it that way. 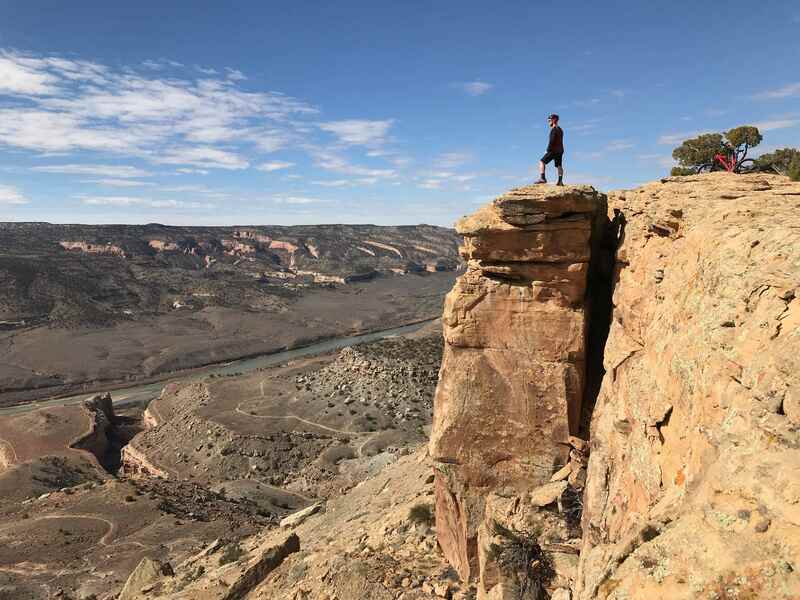 As you head down Highway 191 from I70 towards Moab, the first set of trails you hit are in the Klondike Bluffs area. There are several fun rides here. Because they are short, you can stitch them together in a variety of ways. At the north end of the park are Alaska, Homer and Nome. I rode up Mega Steps to Alaska. At the top of the trail the views of the Salt Valley below are stunning. And you have great views to the south and west too.